Whilst working as recruitment consultants, we often get asked by candidates what they can do to improve their chances in relation to a specific job that they may be considering applying for. Very often there are a whole raft of things that someone can do, particularly in relation to their CV, but quite often the person does not want to hear that this involves hard work or changes that will involve some effort. What people want to hear is that they can have some sort of positive thinking that would change their chances of success with a particular firm. 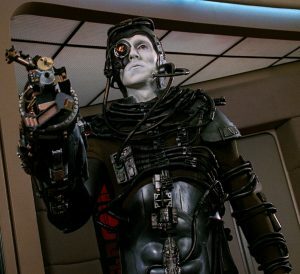 Do you need to become a Borg to stand a good chance of success when applying for a job? However, the main way of improving your chances of success in relation to a specific job is to turn into a Borg. A Borg is a fictional character from the film series of Star Trek. The borg kills its enemies (and anyone else), assimilates the victims and conquers planets turning everything and everyone into a Borg. The word “assimilating” is very important when it comes to making job applications. Quite often we see solicitors applying for legal jobs where the CV has absolutely no resemblance whatsoever to the description of the person required by the solicitors’ firm. Let me give you an example. Last week we took an application from a candidate with 5 years’ experience in litigation, with over 6 pages of detail about their litigation experience which appeared to be fantastic, of good quality and recent, but used when the person was applying for a Wills and Probate position. On page 6 of the 7 page CV, we found some information about their wills and probate experience which was useful and demonstrated to us that the candidate had some wills and probate experience and was not just applying willynilly for jobs. Unfortunately, this candidate had not assimilated at all. He or she would never become a Borg and their chance of success in applying to that particular job were virtually nil. In order to apply for a job you need to be the person that the solicitors’ firm wants to employ. If you are not, then it is unlikely you will stand much chance of success with your application. So when you see an advert for a conveyancing solicitor, specifically with experience in leasehold enfranchisement (for example) send in a CV that, in the first half of the page, contains details of your leasehold enfranchisement experience. At the very least have a paragraph outlining when and where you have gained this experience so that the person reading it can at least see that you have acknowledged it as a requirement for the job. Similarly, if a job advert (and it does happen all the way up to senior level) specifies that you need to have a 2:1 degree, do not leave this to page 5 of your CV for someone to have to go and find it. include it in the summary at the top of the CV so that anyone reading it can instantly see that you fit the criteria and it is not going to be a waste of their time to read through all of the CV. I will let you into a little secret. Recruitment consultants, recruiters and employers, do not read your CV. They may skim read bits of it but it is very unlikely that much more than this will ever be looked at in the grand scheme of things. We just do not have the time as recruiters to do this because we may be looking through 10-15 CVs in order to find a suitable candidate. Furthermore, if we are looking through a CV and it takes us until page 6 to find your wills and probate experience and the post is for a wills and probate solicitor, then we will probably deduce in any event that you are going to be wholly unsuitable for the vacancy and have simply added in the wills and probate experience in the hope that it shows you have at least done it at some point in your career. Assimilate, become a Borg and improve your chances of success. Jonathan Fagan is managing director of Ten Percent Legal Recruitment and regularly writes articles for the Ten Percent and Legal Recruitment BlogSpot website. You can contact Jonathan via email at cv@ten-percent.co.uk.